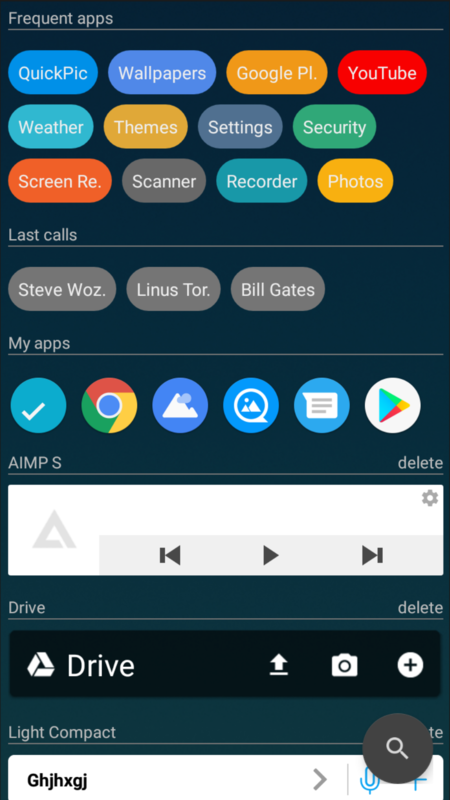 AIO Launcher has a concise and utilitarian interface that will not distract you with bright icons and unnecessary animation. Almost every element of the interface is customizable. You can change the layout of the widgets, colors, font size and more. 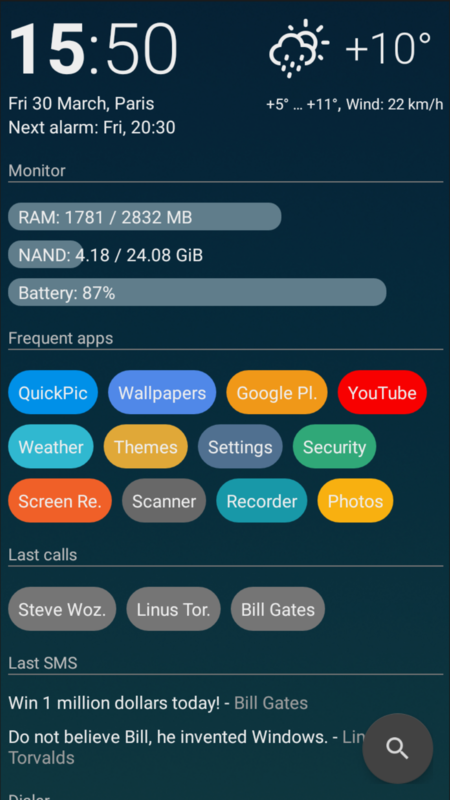 AIO Launcher can display weather, calls, SMS, mail, news, exchange rates, and more. AIO Launcher includes more than 20 different built-in widgets that display a variety of information. In addition, you can install additional widgets using plugins. 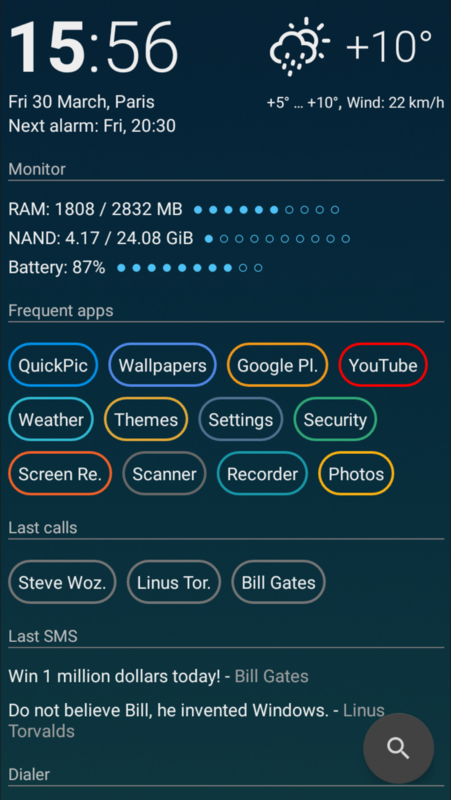 In addition to the built-in widgets and plug-ins, AIO Launcher supports standard Android widgets, which you can install from Google Play. You can place any icons on the screen using the icon pack that you like best. Amazing app. Finally something that makes use of my phone as i wanted it. This is the best launcher where you can find everything on the home screen itself its very customised and very good. All launchers I've used go sort the apps in grids, but in different shapes and sizes. 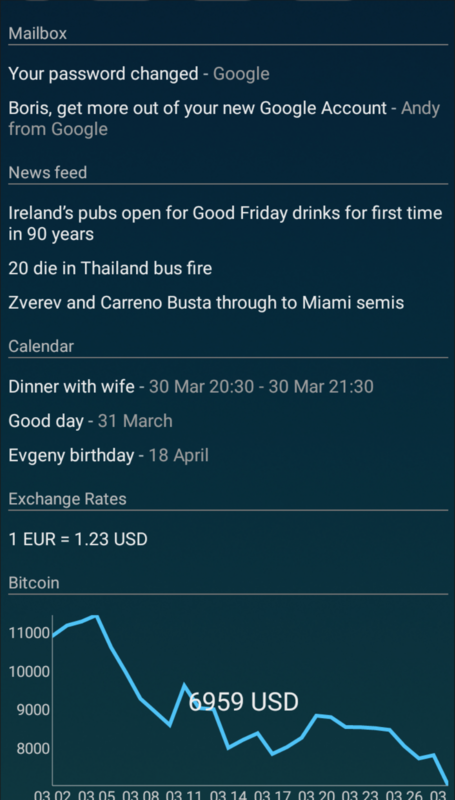 This launcher goes a whole different way, and shows everything (apps, notifications, news, time, etc.) in just one home screen. I like the simplicity. It reminds the data pads from Westworld. After trying some launchers I realised this is my favorite, I'm not changing. Phenomenal app!!! I didn't expect an interface so clean, minimal and very intuitive! This launcher works smoothly with my Samsung tablet S, and the default offerings it gives are more than I could ask for. Want to record a song? sure just tap right in the screen, no need to minimize and open up yet another app to do so. A very nice alternative to the typical grid of icons interface. I like it. AIO Launcher supports themes, including a black and white theme that will not distract you. Any theme settings can be changed, including font size, colors, the form of interface elements. You will get reply to provided email.